The D-450 is a basic system, with the performance and potential for expansion of our more advanced ones, for example D-480, D-505, and D-525. In fact, with the right accessories the D-450 can be converted into any other Easy-Laser system. The general idea behind the system is “simplicity for the user”. All parts included in the system are developed for rough use and to be easy to mount on the machines. As a user you are given step-by-step instructions on the display through the entire measurement procedure. Even though the technology inside is rather advanced, the measurement principle is straight forward. It is based on the “reverse indicator method” with two laser/measuring units mounted on each side of the coupling. 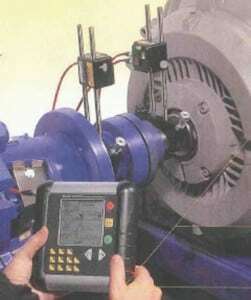 The D-450 System includes two measurement programs: Horizontal shaft alignment and Softfoot. The displayed measurement resolution can be set as low as 0.05 mils/thou [0.001mm]. when the measurement is complete you can produce a printout, save in the display unit or transfer the data to your PC.